It seems like you often have to choose between personalized service and quick service, but that’s no longer the case. With the Salon D’Artiste mobile app, you can customize your interaction with us and accomplish it all quickly and easily when it’s most convenient for you. No calling, no waiting. If you prefer a more traditional way to interact us, you can always find all of this information on the Salon D’Artiste website. And of course we’re always happy to speak with you in person. Give us a call on 610.687.2020 or come and see us at the salon at Eagle Village Shops at 205 Lancaster Ave. #2 in Wayne. 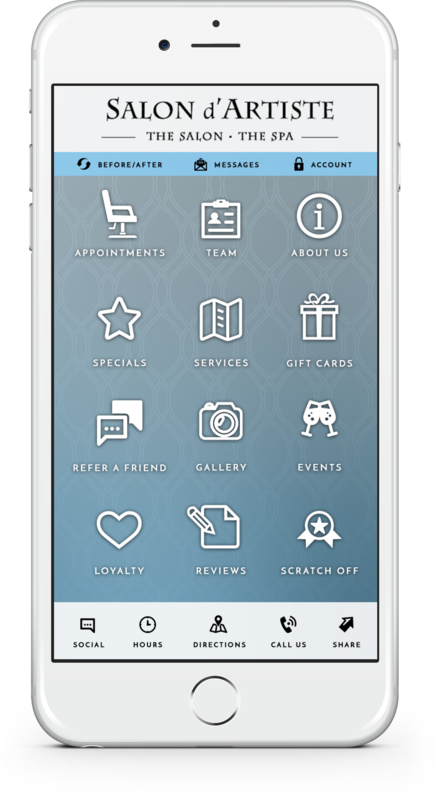 We were the first day spa on Philadelphia’s Main Line way back in 1985, and now we’re out in front again with our free mobile app. Our mission is to always make it easier than ever to look and feel your best, and to ensure your complete satisfaction with every visit.